and in other news, a little boy was killed in a fatal suddeness accident at the local poll…. Why should I listen YOU! YOU’RE just a sign! 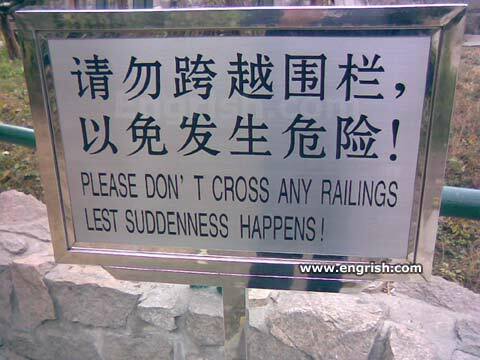 You are safe from spontaneity on this side of the railing. Please refrain from being spontaneous beyond this point. Can I annoy, torment, pester, molest, worry, badger harry, harass, hackle, persecute, irk, rad, vex, bother, tease, nettle, tantalise, or ruffle the railings? I mean only IF suddenness happens? Refrain from thine suddeness, my son! People always assume they’re immune to this sort of thing, but suddenness can happen very, very suddenly..
*starts to climb over a railing* Lest what? oh…OH MAI GAWD!!! Jazz is all about Suddenness. The railings do not like to be crossed. And they have Uzzis. Dammit! Suddenness happened! is there any toilet paper? Suddenness happened to me but she said it happened to all guys.